Sydney Johnson of Beloit is among the nations best. Beloit is a known sports community in Kansas that is home to around 3,800 people in North Central Kansas. 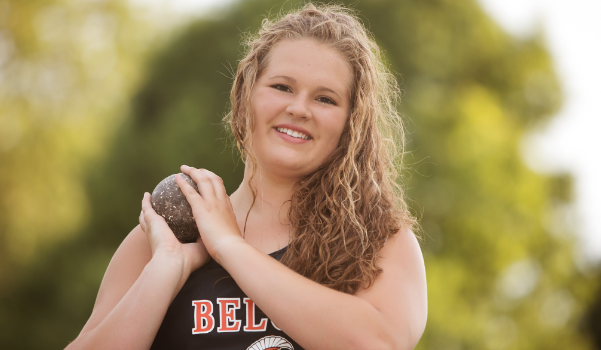 At Beloit High School, a class 3A program home to the Trojans, there is one of the best girls throwers in track and field in the country in senior Sydney Johnson. Johnson, a 6-foot-2, senior, currently ranks #1 in Kansas in both the shot put and discus in all classifications of Kansas. Her shot put mark of 44-10 ranks 22nd in the country this season, which is also the school record. Johnson’s discus throw of 150-00 this past week, also at the Smith Center meet like her shot put mark, ranks 19th in the country. It also became the school record, beating the mark of Kristi Stilwell Adams of 149’9 set 16 years ago. State record for the girl’s discus is 166-07 set by Kearsten Peoples of Ottawa in 2010, who would go on to throw at Mizzou. Mizzou also is where Johnson just signed this past week, a place that had been heavily on her since her sophomore season. Johnson was the 2016 3A state discus champion as a sophomore. Mizzou is one of the best throwing schools in the country that has produced Olympians including known shot put icon, Christian Cantwell. “Mizzou was the first Division I school to contact me and it was after the KU relays my sophomore year. What I liked most about Mizzou was that they liked that I was a three-sport athlete and had good grades instead of just my throwing distances.” Johnson said. Beloit High School is known in track and field over the years, especially in the throwing events. The current throwing coach and principal at Beloit High School is Casey Seyfert. Seyfert, a 1997 Trojan alum, has the fifth best throw all-time in Kansas history in the shot put at 65-01.75. Seyfert’s high school teammate Tony Thompson, a 1998 alum of Beloit, is sixth al-time in Kansas at 64-06.25. Thompson also has 13th best discus mark of all time in Kansas history at 194-07. To give you an idea how good those marks are, the top mark in Kansas this season is just over 55 feet in the shot and 181 in the discus. Last year, Johnson’s high school teammate, Kourtney Hubert, signed with Wichita State and has one of the top 30 all-time throws in the javelin in Kansas history at 148-00. No matter what the year is you can almost always count that there is a Beloit athlete in the mix of javelin, shot or discus. “Beloit throws is a tradition that is generational. In the throwing experiences I have had throughout the Midwest, the throwing circuit knows Beloit. We have produced throwers that have numbers that are unmatched over the years. I feel just coming from Beloit that it helped me out in the recruiting process.” Johnson said. Although Johnson has had a breakout season in the throwing events so far in 2018, her mind is set on getting back to Cessna Stadium next month and getting a couple of state titles as well as helping her team reach that goal. Her last and only state title came in the discus in 3A as a sophomore two years ago. “I’ve experienced the highest at Cessna Stadium in winning a state title as a sophomore and the lowest low after taking fourth place last year. Both experiences have helped push me to where I am at today.” Johnson said. Not only is Johnson one of the top throwers in the country, she’s also a very good three-sport athlete in the state of Kansas. She has been all-state in both volleyball and basketball for the Trojans. She had 17 double-doubles in basketball this season and led the state in hitting efficiency at .544 in volleyball. She will be back in action this Tuesday at the Lions Club Invitational at Republic County before throwing at the KU Relays this coming Friday and Saturday. We caught up with the outstanding senior below in the latest Q&A edition of Faces in Kansas. I would say my involvement with sports started from the beginning. When you live in Beloit, Kansas participating in youth sports is almost an automatic, everyone does it. Sports has always been a cornerstone of our community and almost everyone participates at some level. I also come from a family that has always had a strong sports influence. The Johnson and Heidrick families both revolve around athletics, it is what we have done and it is what we do. We all enjoy competing and we love to support each other while we compete. I’m so lucky to have all three of my grandparents attend every meet and game, they all have supported me for so many years. My personal number one goal for the 2018 track and field season is to earn two gold medals at the state meet. I walk into the weight room everyday with that task engraved in my brain. Every lift and every throw is about that goal, it truly is my mission. Another goal I had this year was to break our school discus record. Kristi Stillwell Adams has had the BHS women’s discus record for 16 years at 149’9. I broke that record April 10th at the Smith Center Redmen Relays. The next day Kristi sent me special note congratulating me on the accomplishment, it was really special. As a team our 2018 track and field goal is to hang another banner. What is it like to go your school? I love being a BHS Trojan! Beloit High is a very special place and I am so lucky to have gotten the opportunity to spend my high school years there. We are blessed to have a school with high character, great expectations, and community pride. The staff and students at BHS work hard to make our high school an exceptional place. So young and already so good, what has that been like? Well, when you are a six foot sixth grader with size 14 shoes, you start to gain some attention at that point. I think because of my size alone, I’ve always had some expectation to be an athlete and when I was younger and uncoordinated those expectations were at times difficult to understand and meet. However, overall it has been an exceptionally fun ride. I have been blessed with so many amazing teammates and the Lady Trojans have had many accomplishments over these last few years. All of us have worked hard for our teams to be good, to build programs, and carry on Trojan traditions that hopefully will last a long, long time. Nothing can describe walking up to Cessna Stadium for the first time my freshman year, it truly was overwhelming. All I remember were the numerous people, the lights, the constant cheering, and the intensity that radiates from the stadium. I’ve experienced my highest high at Cessna, 2016 3A State Discus Champion, and my lowest low at Cessna, my 2017 fourth place finish in discus. Both experiences have pushed me to where I am today. Some of my strengths include leadership, work ethic, dedication, and a good teammate. Being a good leader and setting a good example by hard work is something that has always been very important to me. I’ve been blessed with some amazing teammates while at Beloit High and the memories we have made together will last a lifetime. Accepting nothing but the best in everything I do is probably my biggest weakness. I will not stop until the task is done to perfection, which is a trait that challenges me every day. Accepting mediocracy is also something I am not very good at. However, I’m very lucky to have my sister who always reels me back to reality, usually with a hilarious comment which helps me keep what’s truly important in perspective. Take us through what kind of training you go through year round? I have played and trained for all three sports year-round since the 7th grade, with a strong emphasis in the weight room. I started lifting weights the summer of my 6th grade year. I have taken a weights class during the school day since I was a freshman. My training really intensified this year with our new weights coach Mr. Gober. My highly successful senior year can be credited to Mr. Gober’s new program focusing on agility, speed, strength, vertical, etc. You chose Mizzou, talk about the process and what that was like? What all events will you be doing? Coach Ross Richardson from Missouri saw me throw at the KU Relays my sophomore year. Our communication started after that meet and things just developed from there. Mizzou was the first Division 1 school to contact me so my interest with Mizzou was high from the very beginning. What I liked about Coach Richardson the most was he wasn’t 100% focused with my throwing distances, he also liked that I was a 6’2” three-sport athlete who had good grades. What I love the most about the University of Missouri’s Track and Field program is their unity, they truly are a family. Their cohesiveness radiates from the athletes, coaches, support staff, and even their front office. They are proud of their program and the recruiting pitch is an easy sell, I’m blessed to be chosen by them. I will be throwing the shot put, discus, and maybe hammer next year. What is it like to throw at Beloit, a throwing powerhouse? Beloit throws is a tradition that is generational. In the throwing experiences I have had throughout the Midwest the throwing circuit knows Beloit. We have produced throwers that have numbers that are unmatched! Honestly, I feel just coming from Beloit helped me in my recruiting process. When colleges from the Midwest learned I was from Beloit, their interest increased immensely almost every time. When you have school records like Beloit has, even at the elementary school level, you know the expectation is high. What I love the most about throwing for Beloit is that it is a spectator event. Many people at Beloit come to watch the throws, we have bleachers by our pits because it draws such a crowd….that is something truly special! Other key athletes on your team this year and what type of team should you have? The Beloit Lady Trojans have the state title as their number one goal for the 2018 season. Our team looks a little different this year with points coming not only from the throws but also in distance and the jumps. Coach Isbell is a master at putting kids in the right events to score the most amount of points possible. What is your coach like to throw for? Coach Seyfert is awesome! He pushes me every day, he doesn’t accept having the top throws in the state of Kansas good enough, his expectations are extremely high, and I enjoy so much working to meet those expectations, they make me better! Not many people get to work with an all-American who still holds throwing records at the high school and collegiate level. Also, he’s got the cutest kids ever! Best thrower you’ve ever faced and who are some key ones this year? At the national level, the best throwers I have ever faced were at the USATF Junior Olympic Nationals. You think you are a talented thrower until you get to that level and then the competition rises significantly. At the state level, the Dalinghaus sisters from Nemaha Central are very strong competitors. I admire their dedication, work ethic, and sportsmanship. My former teammate, Kourtni Hubert, is also one of the best throwers I’ve competed against. We battled every day in practice in the shot put ring and that intensity made us both better thowers. Do you play any other sports, tell us about that and your accomplishments/goals? I have also spent a lot of time playing volleyball and basketball, pretty much year-round. I have been recognized on the 3A All-State teams for both sports, as well as first team NCAA All-League. In volleyball I lead the state in hitting efficiency at a .544. My proudest accomplishment in basketball is achieving 17 double-doubles this season and the Lady Trojan’s first triple-double in school history. This year’s seasons in volleyball and basketball were so much fun and we accomplished many things. I can honestly say I could not have been surrounded by better coaches in all my sports, they have been my biggest advocates and fans. What’s it like to grow up in your town? What I love the most about Beloit is its cohesiveness, community pride and tradition of high expectations. Not many people realize that Beloit is a town that only has two stop lights but also has not one, but two, high athletically and academically achieving school systems. Beloit Jr. Sr. High is looked upon as a long standing powerhouse in 3A, Beloit St. John’s Catholic Schools is also held to the highest regard at the 1A level. There have been many years that both schools have made it to the state level of competition, which makes living in Beloit a lot of fun on so many different levels. My favorite subjects in school are science and math. Ultimately, I plan to apply to medical school or pharmacy school after completing my undergraduate degree. The field of health and medicine is something that I have been interested in for as long as I can remember. I have a personal goal to return to Kansas, and rural medicine is the area that I am very passionate about. Helping others is something that I feel very strong about and there is an enormous need for health professionals in rural settings. Beloit is pretty lucky to have many great restaurants all serving so many different kinds of foods. Not a lot of small towns have that luxury, so it’s pretty hard for me to choose just one. However, I will have to say my ultimate favorite place to eat is probably my own kitchen. My dad is probably the best cook ever! When people hear Jimmy Johnson’s pulled pork is going to be served at the concession stand there usually is a really long line waiting to be served.